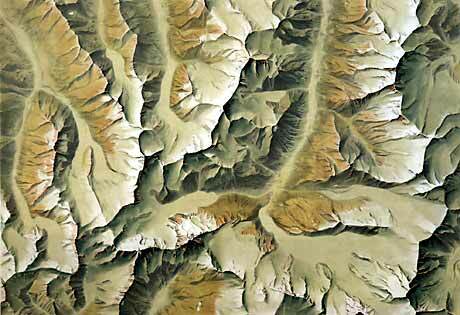 In 1891 the Swiss Alpine Club published “Evolena–Zermatt–Monte Rosa” (Matterhorn in the lower left), a map containing remarkable shaded relief and cliff drawings. The lithography was executed by Rudolf Leuzinger. The brothers Kümmerly from Bern made the rest of the map including the relief shading and final lithographic printing. Eight colours were used in the printing process. “Evolena–Zermatt–Monte Rosa”. Special print of the coloured relief shading. By Rudolf Leuzinger and brothers Kümmerly 1:50,000, 70 x 48 cm, 1891. 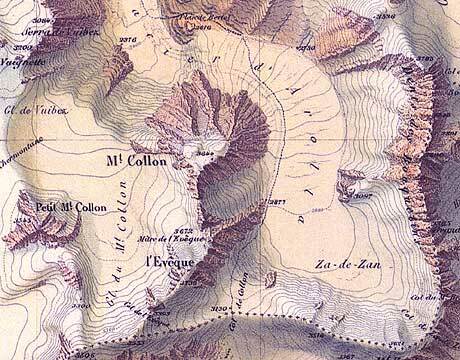 “Evolena–Zermatt–Monte Rosa” (lower left section of a facsimile available from Cartographica Helvetica). More information on the SAC excursion maps may be found in the section Swiss Alpine Club maps and/or in the special issue No. 22 of the journal Cartographica Helvetica.